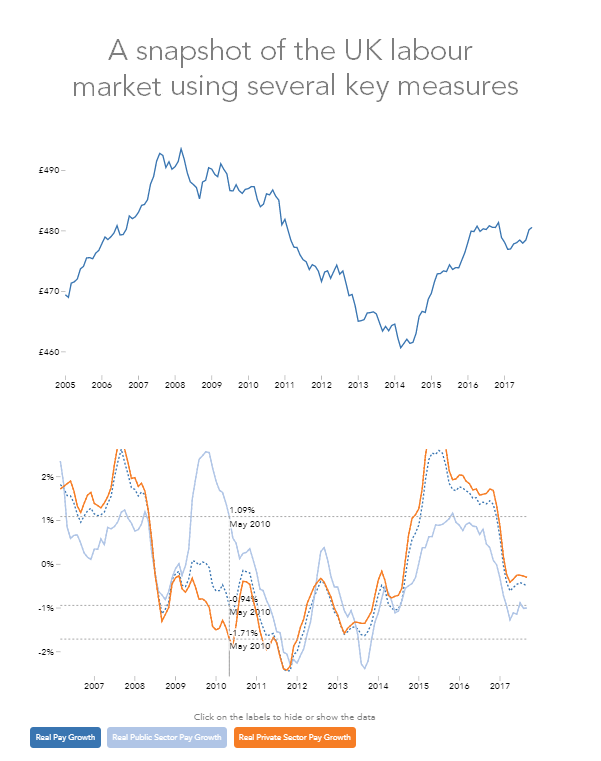 A snapshot of the UK labour market using several key measures. Britain is in the middle of a pay squeeze that is far deeper than anyone expected. What’s most concerning is that while inflation continues to rise, wage growth is actually weakening and making the household income squeeze even tighter. The terrible news on pay comes despite another strong jobs performance, with unemployment remaining at its lowest level in over 40 years. The sharp contrast between our terrible record on pay and strong jobs performance shows that the currency-driven inflation we are experiencing is not feeding through into wage pressures and is simply making us all poorer instead. The pay recovery stalled in 2017, and real wages are currently falling. We have already experienced a lost decade in terms of wage growth, and average wages are still £15 short of their 2008 peak. The Resolution Foundation’s most recent projection is that real wages won’t recover their 2008 level until 2025. Wages have now been falling in real terms since February 2017, with public sector wages falling by 0.6 per cent over the year to October 2017, and private sector wages falling by 0.3 per cent over the same period. Northern Ireland is the only nation or region of the UK with a lower employment rate than on the eve of the downturn. The 16-64 employment rate stands at 75.1%, near its mid-2017 record high. Recent increases in employment have been driven by growth in the number of employees, but it is still the case that over 40 per cent of all employment growth since 2008 has come from self-employment.